It was while living in Central Jersey surrounded by horse farms, that I truly discovered my love for riding and horses. (Fun fact: New Jersey has more horse per square mile than any other state in the U.S.). Ten years ago, I purchased King, my quarter horse mix, at an auction in Texas. He’s happily made the transition from ex-working horse on a Texas ranch to a spoiled chestnut gelding in Hillsborough. King helped me quickly learn there’s a reason horses and therapeutic riding benefit us on such a deep emotional and psychological level. Horses see our inner-selves. They don’t care if we’re rich or poor or successful or not successful. They see us as we really are. There’s no room for ego when it comes to your relationship with a horse. You have to earn their respect. You have to be honest with them and yourself. Plus, riding takes concentration. When you’re stressed and you climb on your horse to ride, you have no choice but to fully focus on the task at hand. It clears your mind and there’s no better way to appreciate the enchantment of life than riding a horse across a spring green meadow. Horses are graceful, glorious creatures. There are so many things that are perfect about them: the way they move, their intelligence and personality, their fluid bodies and shining coats. Each one is fascinating, yet different. They have lots of attitude and character with just enough modesty. 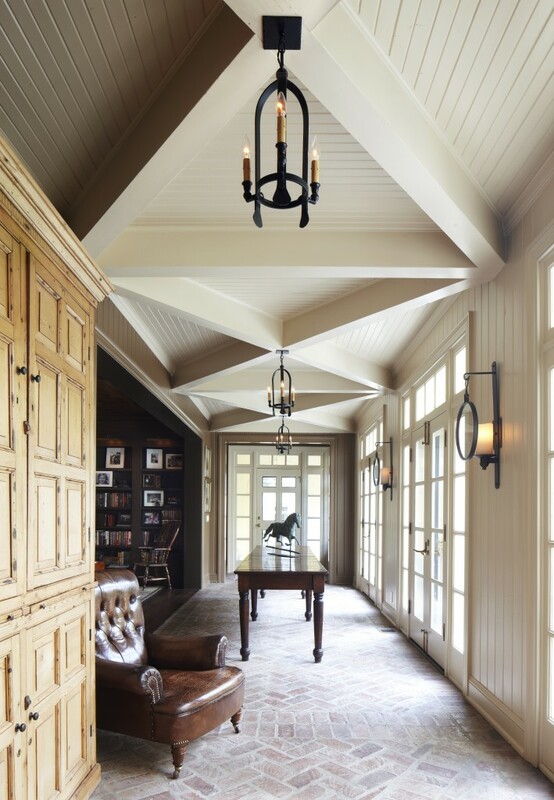 It’s that same mixture of fun, relaxation, elegance, comfort, power, beauty and inspiration that captivates us in interior design and it’s why we love equestrian chic spaces. They’re warm, inviting and visually impactful, much like horses themselves. But beyond the visual aesthetic of a well-designed interior, it’s the positive emotional impact that we want to achieve for those who live there. Whether you’re an avid rider or you’ve never even sat on a horse, the sophisticated and classic equestrian chic style has wide appeal. It’s timeless and works equally as well in a traditional country home in NJ as it does in a modern loft space in NYC. Just look at Ralph Lauren as an example. His equestrian elements and motifs began as the basis of his Polo Line, which was wildly popular among people of all walks of life, and then carried over into his home furnishings and fabrics line, which also happens to be sought after by homeowners with a whole range of tastes and styles. We think there’s a parallel between riding and interior design. If life is busy and stressful and you want to simplify things, spend time with a horse. Or, relax in a well-designed room that captures and expresses your inner-self and achieve a similar sense of wellbeing and comfort. Though, it really couldn’t hurt to do both! Newer PostYour Thread Count Might be Killing You! Older PostCan You Afford (not!) To Work With An Interior Designer?